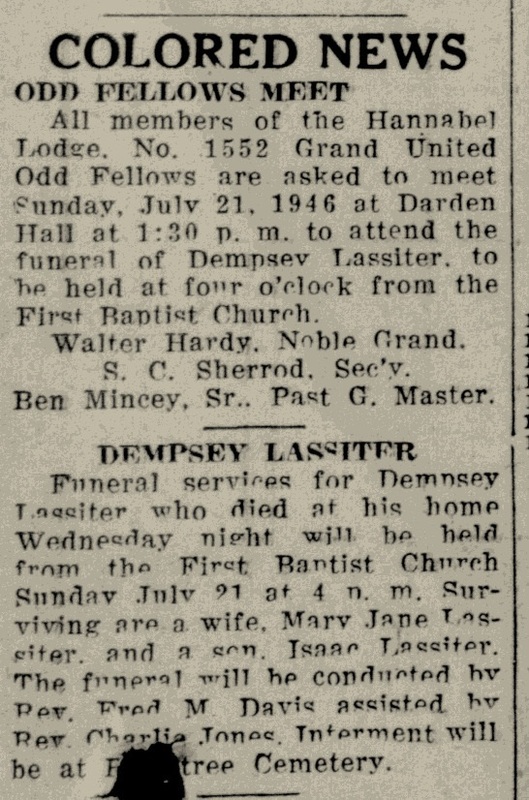 The funeral of Odd Fellow Lassiter. Wilson Daily Times, 19 July 1946. In the 1880 census of Wilson township, Wilson County: farmer Green Lassiter, 55; wife Mary Ann, 42;and children Henry, 19, Sally Ann, 17, Hardy, 15, John Green, 10, Dempsey S., 5, and Mary C., 2. In the 1900 census of Black Creek township, Wilson County: Liza Dawson, 40, and boarder Dempsey Lassiter, 26, sawmill engineer. In the 1930 census of Wilson, Wilson County: at 106 East Street, owned and valued at $1250, Demsey Lassiter, 55, wife Mary J., 44; nephew Charles Bynum, 16; and nieces Katie Powell, 10, and Willie M. Leonard, 6. In 1940, Charles Lee Powell registered for the World War II draft in Wilson County. Per his registration card, he resided at 114 South East Street; was born 10 June 1918 in Nash County, North Carolina; his contact was his uncle, Dempsey Lassiter, 110 South East Street; and he worked for G.S. Tucker & Company, South Goldsboro Street. Isaac T. Lassiter was born in 1940 to Dempsey Lassiter and Mary Jane Bynum. Walter Hardy — in the 1940 census of Wilson, Wilson County: W.P.A. laborer Walter Hardy, 55; wife Mary, 48, tobacco factory stemmer; and children William, 26, tobacco factory floor hand, Robert, 19, Mary Elizabeth, 17, and Roy, 14. S.C. Sherrod — Solomon Conton Sherrod was a native of Wayne County. In the 1940 census of Wilson, Wilson County: at 802 Viola Street, Solomon Shearard, 60; wife Josephine, 52; and children Flora, 15, Beulah, 13, Elmer, 11, and Solomon, 21; plus “son’s wife” Mildred, 18, and grandson Ernest E., 8 months. Charlie Jones — In the 1940 census of Wilson, WIlson County: at 412 Viola, owned and valued at $2000; Charles Jones, 61, janitor at Vick School; wife Gertrude, 59, a tobacco factory stemmer; daughter Ruth Plater, 35, divorced, teacher; grandsons Torrey S., 12, and Charles S. Plater, 11; son-in-law Ruel Bullock, 35; daughter Louise, 30; grandsons Jacobia, 7, Robert, 6, Harold, 4, and Rudolph, 7 months; and granddaughter Barbara Jones, 6.